When the Dominion of Canada was created in 1867, governments did not assume direct responsibility for the poor. Before 1867, only the Maritime colonies had adopted English Poor Laws; there were no workhouses, in which the poor were given accommodation and food in return for work. Responsibility for the poor usually fell to churches and charities, and very poor people often ended up in houses of refuge, mental institutions, or prisons. Official and elite attitudes toward the poor were often negative or condescending. It was assumed that poverty resulted from a moral failing on the part of the poor. Idealistic visions contributed to such attitudes: Canada was a place with abundant land and resources where anybody willing to work was bound to prosper. This utopian vision of Canada ignored the reality that farms were very difficult to establish, that resources were highly seasonal, and that winter was a time of shortage and hardship for a large number of people. In the last half of the 19th century, urbanization and early industrialization increased the number of urban poor. A new type of poverty appeared: poverty that resulted from unemployment — not merely seasonal job shortages, but the shortage of wage-paid jobs due to economic cycles, the closing of businesses, short-term layoffs, and trade depressions. Historians have shown that in major Canadian cities in 1901, one of every seven families could not survive on the pooled wage earnings of family members. If the poor survived at all, they did so by participating in an informal economy — scrounging, bartering, growing vegetables, or keeping animals, or taking in lodgers, if they had space. Many did not survive. Montreal, for instance, was one of the most dangerous cities in the Western World for newborn babies. At the end of the 1890s, 26% of babies died before they reached their first birthday of illnesses associated with poverty and malnutrition. Studies of average wages in Montreal, Toronto, and Vancouver show that there was modest growth in real wages (which means wages after adjusting for price inflation) in the early 1900s. During World War I, rapid inflation halted the rise in real wages, and gains did not appear again until the 1920s. Then the Depression of the 1930s caused an increase in poverty due to unemployment. It has been estimated that in the winter of 1933, at the depths of the Depression, over 32% of all wage-paid workers were unemployed. In these circumstances, government began, although very slowly and at first without success, to develop policies that would help to alleviate the problem of poverty. The first universal social welfare program in Canada was the Family Allowance program, introduced by the federal government in 1944. The small unemployment insurance program, introduced during World War II, was expanded after the war. These were the foundations of Canada’s social security system or welfare state. The problem of poverty was not solved, however, and relative poverty (meaning wide gaps between low-income earners and others) persisted. Nevertheless, the social security system succeeded in reducing the impact of poverty for many families. 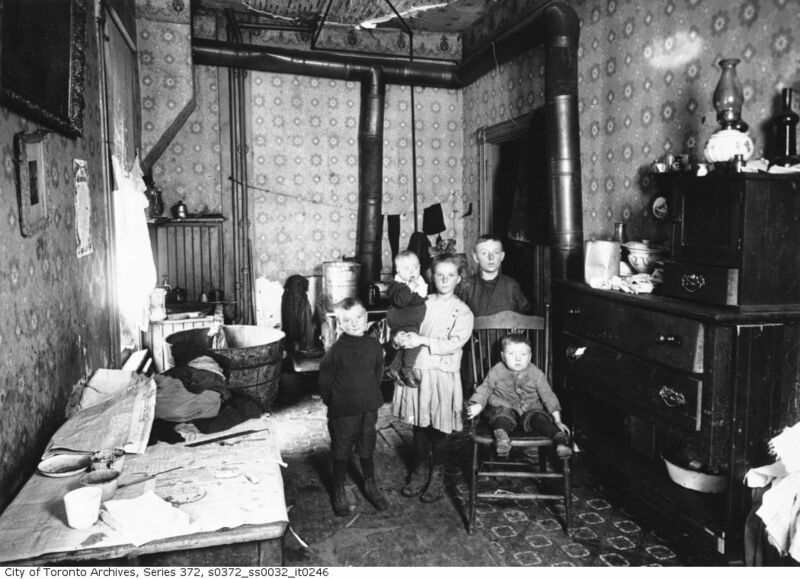 Figure 7.2 A poor family in The Ward, Toronto, 1913. Piva, Michael J. The Condition of the Working Class in Toronto – 1900-1921. Ottawa: University of Ottawa Press, 1979. Bartlett, Eleanor A. “Real Wages and the Standard of Living in Vancouver, 1901 – 1929.” BC Studies, no. 51 (Autumn 1981): 3-62. Baskerville, Peter and Eric W. Sager. Unwilling Idlers: The Urban Unemployed and their Families in Late Victorian Canada. Toronto: University of Toronto Press, 1998. Struthers, James. No Fault of their Own: Unemployment and the Canadian Welfare State, 1914-1941. Toronto: University of Toronto Press, 1983. Industrial and wage-labour changed the character and incidence of poverty in the post-Confederation era. Poverty has been linked in the pre-World War II era with inflation rates that outstripped wage increases. Seasonal, sectoral, and catastrophic unemployment levels contributed to different understandings of poverty. A state response was, consequently, slow in coming. Health Department photographs by City of Toronto Archives is in the public domain. 7.3 Poverty, 1867–1945 by Eric W. Sager, Department of History, University of Victoria is licensed under a Creative Commons Attribution 4.0 International License, except where otherwise noted.